What if there was a doorway into an entirely new kind of human relationship, one in which physical, cognitive, psychological and emotional limitations are transcended; where creativity flourishes; separation dissolves; true equality is achieved; and the outcome far exceeds what either individual could manifest alone? Over the course of thirty years, I’ve developed an approach to piano duet improvisation that is yielding extraordinary results with people of widely diverse backgrounds. As a result, the remarkable possibility I describe above is becoming an actual reality. Here are several examples. In the videos below, you’ll observe piano duets with three very different individuals. In each instance, you’ll hear the person create music of striking originality. Both the student and I flourish. I believe this "Duet Paradigm" has profound implications for parents, educators, business leaders, spiritual teachers, professionals, and practitioners in every field. Hope is a 15 year-old girl with Down syndrome. This duet was, for me, a defining moment. As you'll see, Hope created music of disarming beauty. As a result, I found myself bearing witness to a human capacity entirely unfettered by her “disability.” She confirmed that EACH of us must have extraordinary creative abilities, no matter our background. Two years ago, I improvised in duet with 2½ year-old Sevyn, the son of Robb and Tiffany Smith. This improvisation models a dynamic relationship between adult and child, one that frees a youngster to become fully him- or herself. Observe how, through the music, I sustain my connection with Sevyn from the outset. When he finally sits with me at the keyboard, you’ll see him respond with a sensitivity and nuance that transcends his age. Ultimately, what transpires could not have been premeditated! Pam had limited background in piano. Yet, if you listen carefully to the beauty of tone and musical phrasing, you’ll hear playing that defies her lack of experience. Fully fledged music was already there inside her, waiting to come forth. She wrote later, “I remember wanting to find the right note, feeling self-conscious, a bit worried about doing it ‘wrong.’ Yet I was soothed by the music, the warmth and encouragement...” The result is stunning. 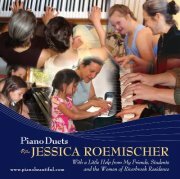 The traditional idea of the piano duet, recast in the 21st century, becomes a model of relationship for our time. As an individual is supported in a dynamic field of trust and exploration, she or he ventures into the unknown, often becoming freed in dramatic ways from physical and/or psycho-emotional conditioning. This can occur with or without the use of music. It arises when someone extends to you presence, trust and unconditional listening. In the space that arises, a person is inspired to let go, to express him or herself in new ways. The unique qualities of individuality are revealed--her or his true "voice." The transforming potential inherent in relationship is realized. People have described this experience as one of "loving remembrance," "of immense joy that washes away residues of pain," "of doubtlessness," of "childlike vulnerability," "where no fear can hold sway." The next phase of my work involves bringing this miraculous paradigm to individuals and groups throughout the world via the internet. For instance, I have worked with children via SKYPE who are part of the Integral Heart Foundation in Guatemala and the Cakike Music Program in Bogota, Colombia. Many of these children are impoverished and often abused. Other recent in-person and virtual events have taken place with: teen girls in protective custody in Sydney; dozens of primary school children in southern New South Wales, Australia; women of economic privilege who never thought they could improvise; people in recovery from heroin and other addictions; young girls struggling to find a sense of identity; people challenged with every form of developmental and physical disability. In the three videos above, you witnessed some of the ways individuals have transcended their disability, age, or background through the duet experience. Based on these and dozens of other striking examples, I believe that the liberating power of duet--which can occur in any human relationship--is a catalyst for widespread change, allowing people to rise above the challenges they face and realize their potential, no matter who they are or where they live. In my thirty years of experience, the Duet Paradigm has never failed to activate the glorious creative energy that exists within each and every one of us.